After a really tough couple of years, the signs are there that Shane Long is rediscovering his scoring touch. He scored for the second game on the trot in the win over Wolves, while Conor Hourihane and Glenn Whelan starred for Aston Villa. Elsewhere, Darren Randolph came up with the goods at a big time for Middlesbrough. Brighton and Shane Duffy had a disastrous afternoon on Saturday, falling to a heavy 5-0 defeat at home to Bournemouth. Despite the manner of the loss he still managed to get a 5/10 from the Brighton & Hove Independent. Shane Long was amongst the goals once again at the weekend, scoring the third in Southampton's 3-1 after coming off the bench. He got a 7/10 from Saintsmarching.com, who mentioned he made some vital contributions in seeing out the result. Got forward to good effect at times in the first half but lacked the decisive final pass or shot, as they all did. Couldn't really be blamed for the defensive calamities unfolding to his left hand side. Taken off early in the second half as Nuno looked to inject some pace in the form of Adama Traore. It was also a disappointing day for Seamus Coleman, who's run of recent excellent form was halted in Everton's 2-0 loss at Fulham. He was given a 5/10 by the Liverpool Echo, who felt he left far too many gaps in behind for his opponents to exploit. Cyrus Christie came off the bench for the hosts in that one. As has been a regular occurrence in the past few months, Jeff Hendrick started in a wide right role for Burnley as they defeated Cardiff. He was given a 6/10 by the Lancashire Telegraph for a solid showing. Harry Arter started for the visitors, putting in a 'busy' performance before being substituted late on for the more attacking Bobby Reid. A 7/10 from Wales Online. Was alert to the danger in the second half as Grosicki beat the Boro defence. Hull improved in the second half but Randolph didn't have many saves to make.....until stoppage time, when he made a stunning one-handed stop to deny Grosicki an equaliser. Randolph got a hand on a brilliant Grosicki free-kick and tipped it onto the bar. The latest - and one of the best - of his many incredible stops this season. Alan Judge started for Ipswich as their relegation to League One was confirmed after the 1-1 draw at home to Birmingham City. Judge was their best player on the day, receiving an 8/10 rating from the East Anglian Daily Times. Blackburn defeated Martin O'Neill's Nottingham Forest 2-1 away from home, with Darragh Lenihan and Derrick Williams the partnership at centre back. John Egan was sent off for this goal line clearance as Sheffield United drew at home to Millwall. Sheffield United defender John Egan pulls off a stunning save and is sent off for his troubles. While Millwall would miss that penalty, they would grab a late equaliser to dent The Blades' automatic promotion hopes. Egan was given a 5/10 by The Star, while Enda Stevens and David McGoldrick were also rated at 5/10. Aiden O'Brien came off the bench for Millwall as gained a point in their fight against the drop. James McClean started on the right flank for Stoke City as they drew 2-2 with Rotherham, receiving a 5/10 from the Stoke Sentinel. Conor Hourihane won a penalty and scored what would prove to be the winning goal as Aston Villa defeated Bristol City 2-1 at Villa Park. He took his goal incredibly well too. After a heavy defeat last week, Derby County got back to winning ways with a 4-0 victory over Bolton. Richard Keogh put in a solid showing, getting a 7/10 from the Derby Telegraph. 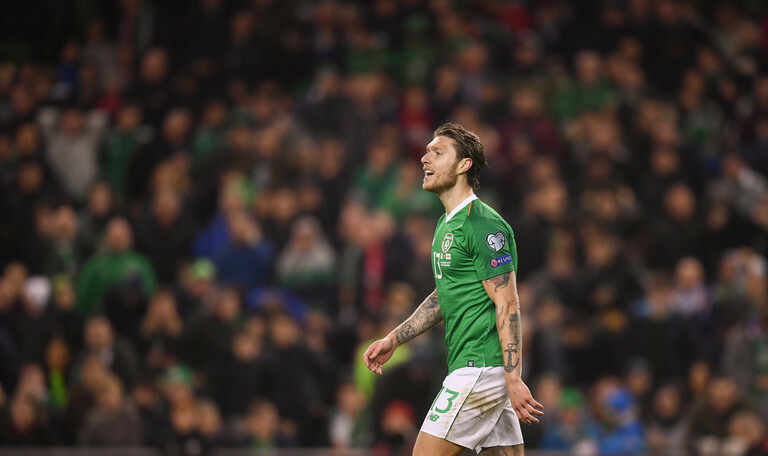 It was not a good day for Ireland's Preston contingent, as they fell to a 4-1 defeat to West Brom. Alan Browne was given a 5/10 by the Lanchasire Evening Post, while Sean Maguire and Callum Robinson only came off the bench.